If you’re deciding on whether to buy the Disney Dining Plan, you’ve come to the right place. 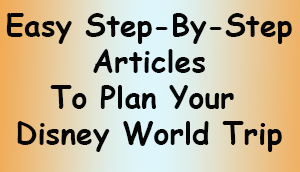 You may also want to read this article: Is the Disney Dining Plan Worth the Money? The Disney Dining Plan allows guests to pre-pay for their food. While at Disney you’ll be given credits to use rather than cash for your food. You’ll pay with your credits using either a Magic Band or RFID card. Who can get the Disney Dining Plan? You’re staying as a Disney Vacation Club member in a DVC resort. You may also be able to get the Disney Dining plan added to your reservation if you’ve rented DVC points from a DVC owner or rental agent. You’re booking an Annual Passholder Package. This includes a Disney resort room. You’re booking a room without buying park tickets. This is a new option which must be booked thru a Travel Agent or by calling Disney Directly (1-407-939-1936). The resort you’re staying in must be a Disney-owned and run resort. Swan and Dolphin and Shades of Green do not qualify for the Dining Plan. Can Children under 3 years old be on the Dining Plan? Nope. Children under three can not be on the Disney Dining Plan. It’s assumed that they will be eating off your plate, or for infants, that you’ll be bringing baby food. Of course you can buy a children’s meal for your little ones, but you’ll need to pay for it. How do you get the Disney Dining Plan? You can only get the Dining plan by going through an authorized Travel Agent, by calling Disney directly or by using Disney World’s website. You will NOT be able to add a Disney Dining Plan to your trip if you booked through sites like Kayak.com, Expedia.com, etc. 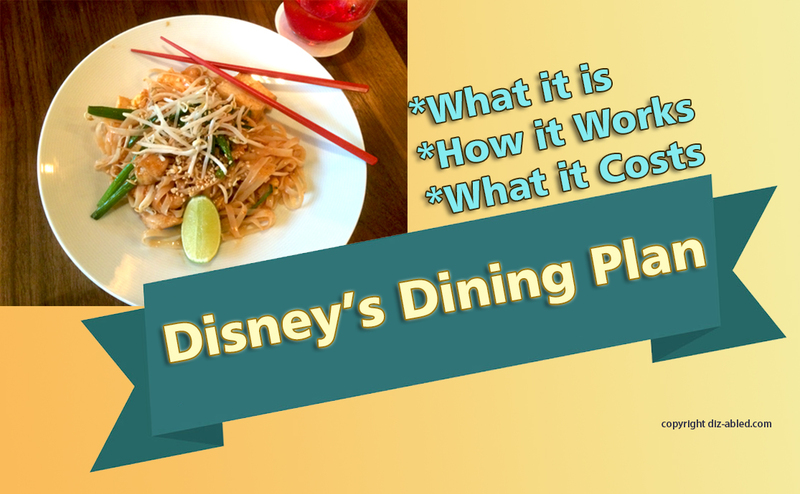 If you get the Disney Dining Plan, do you have to buy it for your entire trip? Yes, if you buy the Disney Dining Plan, you have to have it for every night of your stay. You can not buy it for only some of your stay. However you can use it during your stay any way you want. So for example if you’re leaving Disney property to go somewhere else like Universal on one of your vacation days, you can use the points up on your other days. When does my Disney Dining Plan stop and start? Starts: On the first day once you’ve checked in. Stops: 11:59 PM on the evening of your last day. If you do an online check-in in advance, your Dining Plan along with your park tickets will automatically be activated early in the morning on your first day. 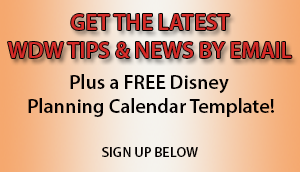 When can I use my Disney Dining Plan Points? You’ll receive credits for every night of your stay, and you can use those credits anytime, in any way, from the time your credits start, to the time they end. So for example, let’s say you’re staying June 1st through June 9th. You’ll be there 8 nights. You will get 8 sets of credits which you can begin using on the morning of June 1st, and you can use them any time between then and 11:59 PM on the evening of June 9th. You do not have to use a certain amount per day. Your unused credits will roll over to the next day. They don’t expire until the last day after 11:59 PM. Tip: If you have extra points on the last day of your visit, you can buy snacks to take home with you! What options do you get with the Dining Plans? Guests can choose from a variety of Dining Plans that allow each person in your party to eat at specific types of restaurants, and to have specific types and numbers of meals and snacks each day. There are also MANY other items that qualify for snacks like dole whip or bakery items. Some of them are far more expensive and interesting than the ones listed above. For example during the Epcot Festivals like the annual Food & Wine Festival, you can use snack credits at the food and wine booths set up around the lake. To find food choices that are eligible as snack credits, just look for this image on the right. You’ll see it on menu boards at counter service restaurants, food carts and even some merchandise locations. When I asked my Disney planning Facebook group what their favorite snack items at Disney are, we got delicious sounding options including the macaroon ice cream sandwich in Epcot’s France Pavilion, candy from the Karamell-Kuche candy store in Epcot’s Germany Pavilion, chocolate bars from Ghirardelli’s in Disney Springs, school bread at Norway’s Pavilion (my personal favorite), sugar free goofy gummies, warm cinnamon bun’s at Gaston’s Tavern (they’re huge), Starbucks drinks, and food and wine at the Food & Wine festival booths. Here’s an article on the Disney Tourist Blog site that talks about their favorite way to use dining snack credits. Quick-Service meals: These include only quick-service restaurants. These are restaurants where you order at a register, and pick up your food at the counter. Table-Service Meals: These are full-service restaurants where you sit down, order and receive service throughout your meal. They can also be used for buffet meals, and for Character Dining experiences. For an extra Table-Service credit you can also eat in Signature Dining restaurants and Dinner Shows. Refillable Resort Mugs: These mugs are for use at your resort only, and only in certain locations. They’re refillable for the length of your package. Can children order adult meals? Disney says that children must order from the children’s menu, where available. When it’s not available, children should be able to order adult meals. We have heard of cast members offering or allowing adult meals even when children’s meals were available. It doesn’t hurt to ask, but it may depend on the Cast Member. If your child doesn’t like any of the children’s meals, ask a Cast Member if there are any other options. They may be able to help you. Tip: Some people share their adult meals with their children and use the extra credit for an additional meal or snacks. Quick service meals exchange for three snack credits. Can you share meals in order to save credit? You can share quick service meals, and you should also be able to share table service meals at most table restaurants. There are all different levels of Dining Plans. Below are the levels and what they include. The info below is for each night of your package stay, and for everyone in your party who’s over 3 years old (kids 3 years old and younger can eat from your dish at no charge). Prices are subject to change. Keep in mind that gratuities are not included. If you have 6 or more in your party, Disney will automatically add an 18% gratuity to your bill. The higher the plan level, the more that’s included. We’ve numbered the levels just to make it easier for you to see which tier the plan falls into, but Disney won’t recognize these level numbers. You can visit here for a complete list of the current participating dining locations within each plan for 2018. This will tell you exactly which restaurants are included with each plan. Cost: Approximately $55 for adults and $24 for children ages 3-9 years old (per each night of your package). To see Disney’s official page for the 2018 Quick Service Dining Plan, visit here. Visit here to see all of the restaurants included in the plan. This is a combination of Quick-Service & Table-Service meals. Cost: $78 for adults and $28 for children ages 3-9 years old (per each night of your package). To see Disney’s official page for the 2018 Disney Dining Plan, visit here. Cost: $119 for adults and $42 for children ages 3-9 years old (per each night of your package). To see Disney’s official page for the 2018 Deluxe Dining Plan, visit here. Note: Starting in 2017, Disney has discontinued it’s upper level programs (Premium Dining Plan and Platinum Dining Plan.